The first thing that stands out in Wroom is the amazing visuals, chockfull of identity and charm. But then we’ll be stunned by the smooth animation and the physics-based gameplay, not unlike JellyCar or Freerider but with an amazing split-screen mode up to four players, using only one keyboard (sadly, there’s no online mode). 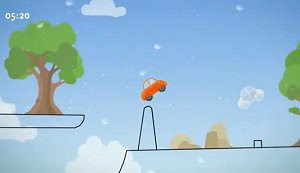 Wroom was created by two indie Swedish developers and features different difficulty levels, star collecting and a mode where you have to beat your best time, represented by a toy ghost car. As far as freeware games go, Wroom is as addictive as they get.